The post JustFoodForDogs Offers Human-Grade Food for Dogs by Lauren Katims appeared first on Dogster. Copying over entire articles infringes on copyright laws. You may not be aware of it, but all of these articles were assigned, contracted and paid for, so they aren’t considered public domain. However, we appreciate that you like the article and would love it if you continued sharing just the first paragraph of an article, then linking out to the rest of the piece on Dogster.com. Manhattan is my favorite foodie hot spot, and now the dog food scene is sizzling, too. JustFoodForDogs, a California-based company that cooks small-batch, preservative-free meals, opened an exhibition kitchen inside the Union Square Petco to promote its mission that dogs live healthier lives by eating human-grade food. 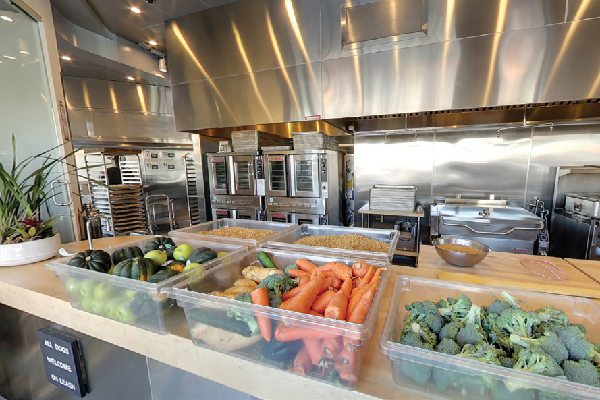 The JFFD chefs produce 1,500 pounds of fresh food daily, while consumers consult with onsite certified nutritionists about trading in kibble for dishes like beef and russet potato sprinkled with a specialized nutrient blend that balances out the meal. “Our founder did trials that proved our food is healthier,” says JFFD CEO Carey Tischler. Thirty participating dogs quit their kibble diets cold turkey and ate whole foods for a year. A series of blood tests proved the dogs were in better shape, Carey says. JFFD has six stand-alone kitchens in California, and through the Petco partnership, Carey plans to serve pups nationwide, starting with New York City, Seattle and Boston this year. Even if you can’t dine in, delivery is available. My Chiweenie, Lucy, gained foodie status at home by ordering from justfoodfordogs.com. Her five-star rating? The dehydrated chicken breast treat.